In this article, we will provide you CA Final ISCA Study material, practice manual, syllabus, previous year papers, Scanner and exam pattern for May 2019 exams. Assurance and compliance services provided by a Chartered Accountant. CA Final ISCA Tips and Tricks to Score High Marks. ISCA is the most critical paper which needs a conceptual and clear understanding of the syllabus. Students can easily score some more marks by following these easy and quick tricks and tips. Don’t confuse yourself in understanding the question:In the paper of ISCA, the first question is usually based on the case study. The case study can focus on topics such as GRC, SDLC, protection of information system, BCP, DRP, or IAS audit guidelines standards. The question from case study will evaluate your understanding and knowledge acquired from 34 chapters of the CA Final study material hence student should read the case study carefully and identify the relevant concepts based on which the questions are to be answered. Don’t give a short answer for heavy weighted questions: It is observed that sometimes students write the answers in brief. If you are attempting a question which has huge marks weighatge you have to give long answers to it. If you write a brief answer to such question it will be hard to score good marks hence before writing the answer student should clearly understand the weightage assigned to the particular question. Don’t ignore the presentation of answers: Wherever possible students should try to include relevant diagrams tables rough sketch etc. Don’t get panic if you don’t understand the question: In final level to check your aptitude sometimes questions are also framed on the generalized topic which may not be adequately discussed in the study material. Read the question again with a calm mind and to answer such questions students should not wear any psychological pressure rather they should write the answer based on the general understanding of the topic and other references to it. 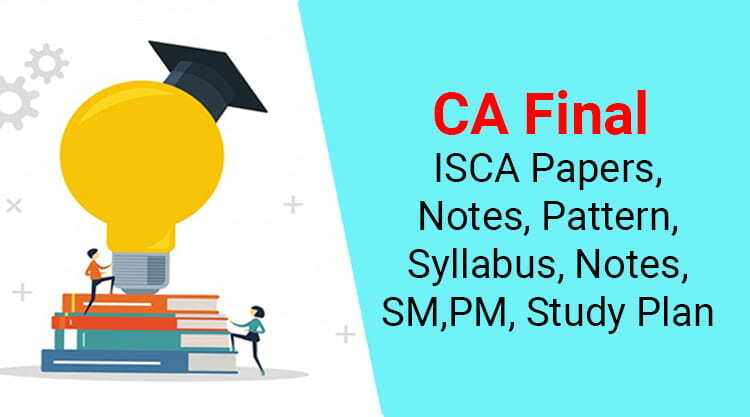 Read our article further to download CA Final ISCA Papers, Notes, Pattern, Syllabus, Notes, SM, PM, CA Final preparation plan. Each question is assessed through comprehensive knowledge, analytical skill, and reporting efficiency. Each question has 3 or 4 sections to be addressed and solved. From May 2019 examination this paper will be assessed partially through MCQ and partially by the old pattern. The ratio 30:70 assessment is where 30 marks will be allocated for MCQ and rest another pattern. ICAI has revised the syllabus under old scheme student can download the notes according to the syllabus of CA Final Information Systems Control and Audit for both new and old Final scheme. ICAI has revised the syllabus under the old scheme. The student can download the suggested answers of CA Final Information Systems Control and Audit For old syllabus from here. ICAI has revised the syllabus under the old scheme. The student can download the ICAI CA Final Mock Test papers for Information Systems Control and Audit for the old syllabus from here. Also, check MCC CA final mock test papers. It’s wise to practice previous question papers to get an idea about the pattern of question asked in exams. We hereby provide you 7-year question paper for your practice. The student can download the RTP of CA Final Information Systems Control and Audit for old and syllabus from here. You can download 7 years RTP for the old final syllabus. The most popular scanners are from Suchitra publication and Tax guru. Keep yourself healthy and tech savvy.